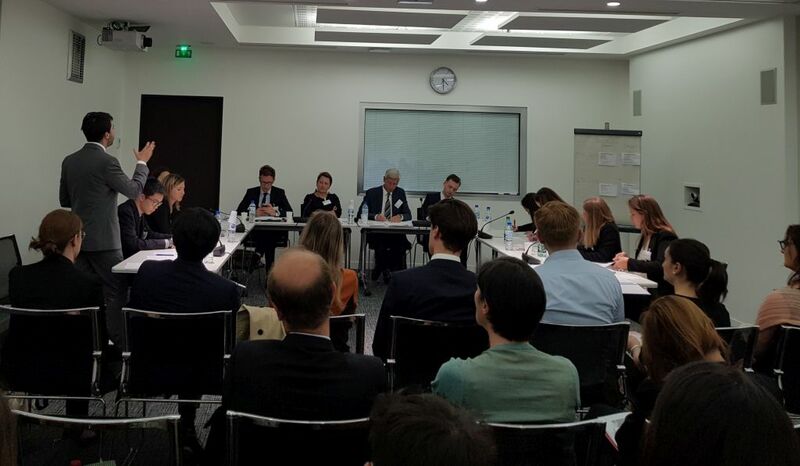 The PAX Moot Eliminatory Round took place last Tuesday in Paris with 8 universities mooting the cross border climate change moot case which addressed a number of complex transnational legal questions in Private International Law and was generously hosted by the ICC (see also our previous post). The PAX Moot Finals will be held on 1 June at the Peace Palace – hence the name – in The Hague, paying tribute to the city as the “legal capital of the world” and home of The Hague Conference of Private International Law, which also marks its 125th anniversary. The winning Mooters and best pleaders will be rewarded with an internship at international commercial litigation departments of renowned law firms Nauta Dutilh in Amsterdam and Herbert Smith in Paris. The inter-university PAX Moot organized by Sciences Po Law School is a pleading competition addressing issues of Private International Law and this year’s 6th edition has gone global to include teams from universities in Europe and beyond. The organizers thank the following institutions for their support and willingness to open the competition to their students: Sorbonne University Paris I, London School of Economics, HEC, Heidelberg University, Luxembourg University, Cambridge University, University College London (UCL), King’s College London, University of Antwerp, Erasmus University, Université Libre de Bruxelles (ULB), Sciences Po Law School and Statale University of Milan. Participation was also open to US exchange students from Harvard, Columbia, Duke, Northwestern, Northeastern, Duke and Penn law schools.